In our town, we revel in our Food Capital status. And so we should. At any hour, we can partake of the great multi-culti banquet that built our reputation. We can taste the authentic stuff or sup on elite spins of every folk cuisine from Cambodia to Kabul. But there’s one continent that’s a little under-represented. God, how I miss the Americas on a plate. My homesick stomach led me to Nacional in Albert Park. Here, Chef Leena Monson is quietly playing with broad American flavours as any hip New York chef from the West Village to Williamsburg might. But the American undercurrents of this menu have been overlooked since a 2009 debut. These undercurrents are easy to miss. On the face of it, Nacional could pass for another chic, inner-suburban joint. The interior and ambience screech Melbourne, from the artfully designed lighting to the impeccable row of tea canisters from T2. At breakfast and lunch, Nacional balances the cafe-restaurant divide with grace. At dinner time, Monson lets loose with the remarkable American flavours about which she is clearly passionate. Meat matched with fruit, like a daily special on the board of pork chops and peach, is a quintessentially American marriage. From there, her unions go South in the best way. From New Orleans, we have BBQ prawns and grilled corn bread. A south-west and Central American influence creates blue corn-crusted soft-shell crab with mashed avocado and lime. Then, we really cross the border with ingredients and condiments like annatto, chipotle and chimichurri. Prepared for our Tex-Mex, Cajun, mid-west and Central American fusion, we order from a list that comprises 38 beers. The wine list is hardly underdone. But, tonight, it’s time for a Corona. Eager to sample Monson’s talents broadly, we order from the printed menu. Here the focus is on small plates designed for sharing at around the $18 mark. Four pieces of complimentary warm grilled flat bread arrive unadorned shortly after our beers. A good start. Spiced gazpacho with crab salsa, served in an oversized shot glass was a great appetiser. The tomato base was nicely spiced and avoided the chunkiness of clumsier gazpachos. 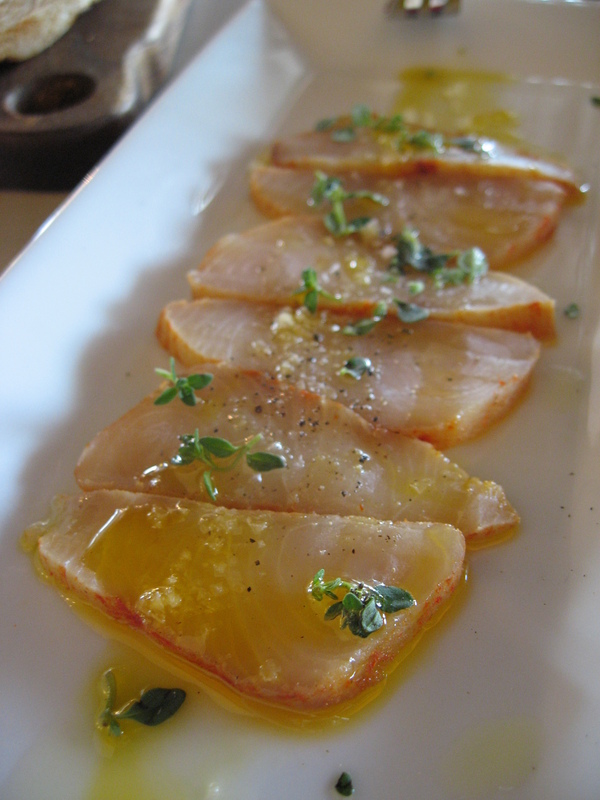 Smoked paprika cured kingfish tataki (pictured), annatto oil and lemon thyme was less successful. The just-cooked thin slices of fish were light on the smoky flavour suggested by the inclusion of the paprika. Likewise, the influence of annatto was negligible. This colour and flavour enhancer derived from the achiote tree is the South American equivalent of turmeric. It was somewhat lost. A squeeze of lime across the plate before it hit the pass would really bring it out and balance a dish that deserves to shine. The roast pork belly with pickled watermelon rind again suffers from a lack of execution. But, the concept is wonderful. On our visit the pork arrives overcooked and dry, adorned with chunks of superbly flavoured watermelon rind. The chicken escabeche with black garlic had Partner giving me that “Why don’t you cook this?” look. It was near perfect. A real stand out, however, is the beef pincho with chimichurri. It’s not often a girl has something of such quality in her mouth. The chimichurri, a South American salsa verde, is spot on, the perfect counterpoint to nicely cooked skewers of quality beef. Nacional has all the right ducks in a row, but the pistol’s just not always firing. With a little daring and a touch more care, this new gunslinger could command a fan base of Modern American foodies. $110 for two, including two beers each. There’s something about laminex. It’s the surface upon which some of the best Melbourne meals I’ve enjoyed have been served: a som tum Thai in Springvale, an Armenian dumpling in Caulfield South and, recently, a pungent, complex achar in less-than-glamorous Syndal. Lim’s Nyonya Hut is visually unimpressive, a little shop-worn and hardly known for its service. Here, you’ll find no superstar chef or coterie of fashionable eaters. You will find laminex, however, and some of the most challenging, compelling flavours this side of KL. 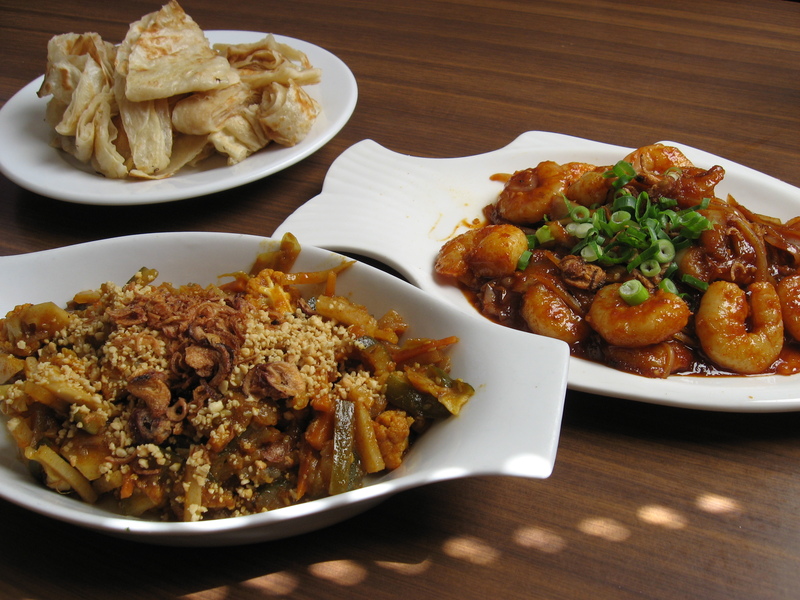 A good portion of the menu is devoted to hawker food. These Malaysian staples are quick, nutritious and often hang on a noodle. Dive into these street eats and try to navigate past the laksas, of which there are three. All three are great, of course. The ubiquitous curry laksa isn’t given any fancy makeover here. It’s a straightforward version with both egg noodles and rice vermicelli vying for space in the mild broth alongside generous pieces of chicken thigh and fried beancurd. Added authenticity comes in the shape of plump little meatballs made from fish. The more atypical Assam and Siam laksas centre on fish, the latter being the coconut version. They are pungent and heady, and you need to watch for bones, but they’ll have you travelling for miles just to get your mouth around it. Likewise, the Char Koay Teow consistently hits the table with that moreish char-flavour that can’t be added but must be loved into existence. This is ‘wok hei’ and it means ‘breath of wok’ in Cantonese, and it takes a fiery vessel and a deft hand to achieve. Chef Beng Lai Lim has such a hand. This guy deserves a coffee table book every bit as much as the CBD’s celebrated superstars – if only for his Char Koay Teow. With nice proportions of flat rice noodles to prawn, egg, Chinese sausage and bean sprouts, you will be jostling for a lunch time table with Malaysian students who know the real deal. Despite the draw of these reasonably priced ($8.50) hawker dishes, on a recent visit I ventured further into the dinner menu and was glad I did. The vegetable achar is a mix of lightly pickled carrots, cucumber, cauliflower and onion topped with crushed peanuts and fried shallots. Its fabulous textures underpin a satisfyingly tangy punch: robust and refreshing at the same time. There are few dishes that can pull off such a double act. The take-home version actually works very well. But there is no doubt I’ll be returning to eat at the laminex soon. Lim’s Nyonya Hut, 240 Blackburn Rd, Syndal. Ph: (03) 9802 3763. BYO.